Sprints are the backbone of every great agile organization. Get your team ready to get things done with our sprint planning template. What is the main purpose of this sprint? Define key objectives below. What user stories match the sprint goal? Share this with your team prior to the meeting so they can contribute. Break each user story down into individual tasks. Make sure each task has as much information as possible. Include important metrics. List out the epics that we're planning to start or deliver during this sprint. Revisit your definition of "done." Decide on the acceptance criteria that will be used to determine when each individual task is complete. Make sure all of this realistically aligns with your team's capacity. What potential issues could come up based on the goal and sprint backlog? How can we solve them? Does the scope of work allot enough time for unexpected issues? What were the main insights and discussion points from this sprint planning session? Get verbal confirmation from your team about the next steps to be taken. Clarify who's completing them and when they should be done by. Note this information here to share and assign. How will we keep in touch and stay up-to-date about progress? Should we schedule a follow-up meeting? For product-centric organizations, nothing drives progress more than sprint planning. Sprints are the foundation of any great agile development team. And the better you prepare for them, the more likely you are to accomplish your objectives. Get your team ready to get things done with our sprint planning template. Our meeting note template empowers your team to move through each step efficiently and effectively. Whether you're diving into your product backlog to determine what tasks need to be done or you're fleshing out epics around specific issues, our flexible sprint planning template lets you focus on what you need to move forward. Tailor its structure to capture a high-level overview of your product vision as well as any details that impact the big picture. Alignment between product owners, scrum masters, and agile team members is integral to running a successful sprint. Our meeting note template cultivates crystal-clear communication through sharing capabilities. So even if some team members are not present for the planning session, everyone can be on the same page about responsibilities and expectations. Part of every great sprint planning session is defining what "done" is. 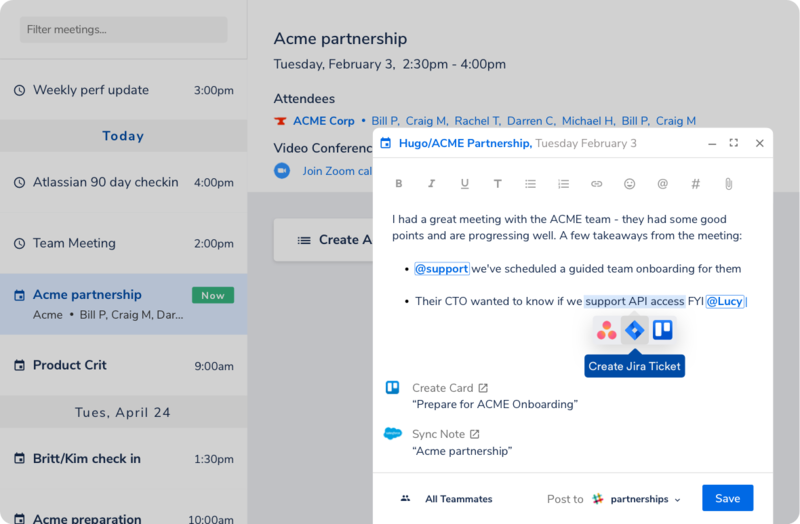 This outline not only lets you lay out the steps needed to reach your goal, but it also enables your team to start taking action towards it right away. Our sprint planning template allows you to turn any note into an assignable action in any major workflow tool or platform with only a few simple clicks. Catalyze collaboration and redefine what can be done with this meeting note template today.